For caregivers with children age birth ' 2 years. Looking for a fun way to work out with your little one(s)? 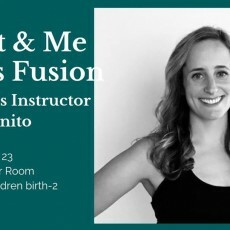 Parent & Me Pilates Fusion is a 45-minute total body workout focusing on rebuilding your core and overall strength and flexibility. Babies can stay in a car seat, boppy, or on a mat or blanket, and toddlers are able to participate or play with toys. With some exercises, parents will have the option to hold and lift baby to enhance their workout and bond with their baby. All levels are welcome. Please bring your own mat and water. Registration will open February 1. Family Friendly Event with the Easter Bunny!